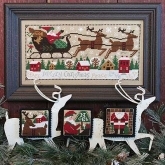 Wishes for Santa Limited Edition kit from JBW Designs ~ 1 only! Gingerbread Santa Mouse chart & embellishments ~ Limited Edition Ornament from Just Nan ~ 1 only! Deck the Halls ~ 2016 Limited Edition Ornament Kit from JBW Designs ~ 1 only!